What is it with combining two seemingly disparate functions that seems to get gadget makers in a lather? 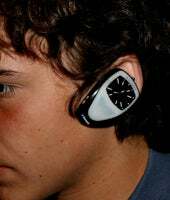 First it was the waterfall/fireplace, now we have the Bluevoice, which serves as both a watch and a Bluetooth headset. Let me first tackle the obvious: you cannot look at a watch while it's in your ear . Okay, it's actually designed so that you leave it on your wrist until you receive a call, at which point you pop it off your wrist and into your ear. But far more worrisome to me is the fact that these are two separate devices that in no way benefit from being combined into one rather ugly device—what do watches and Bluetooth headsets have in common? Nothing . That said, if you feel compelled to own a combination Bluetooth headset and watch, that need can finally be met, in either analog or digital watches, for $127.95 and $119.95 respectively. Or you could, say, take your earpiece off while you're not using it and put it in your pocket.